The largest ever UberEats strike shuts down East London. This article was first published by Notes from Below. 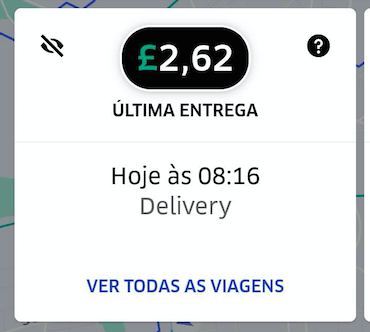 [On Thursday 20th September], the biggest ever UberEats strike entered its second day. Almost exactly two years since the August 2016 Deliveroo strike that first showed that food platform workers could organise and fight, workers in London downed tools again. The strike was provoked by a sudden change to the payment system used by UberEats. The minimum delivery guarantee used to be £4.26. Now, under the new system, orders are being paid at rates as low as £2.62. This dramatic decline amounts to a 40% pay cut. In response, workers have mobilised. Their demands are as follows: a flat minimum rate of £5 a drop, a £1 per mile distance payment, an end to the ‘boost’ system which fluctuates the rates of pay every hour, and no victimisation of striking workers. At 1pm yesterday, workers assembled from across London at an Uber ‘greenlight hub’ in Aldgate. The crowd of mostly migrant workers aimed to force the company into negotiations. For the time being, Uber held out, with a manager refusing to speak to the workers collectively. In order to ‘facilitate’ one-on-one discussions with riders about the new pay scheme, Uber wanted their account details. Workers refused. They wanted collective bargaining, and they knew very well that handing over their details might lead to them being sacked for going on strike. Uber handed out a letter claiming that they had ‘spoken to hundreds of couriers’ about the changes. Riders ripped it up. At one point, workers cornered the Uber manager who was attempting to bring people inside for one-on-one discussions. They asked him if he would work for £2.50 a drop. His only response was to run away, behind the protection of security guards and big glass doors. 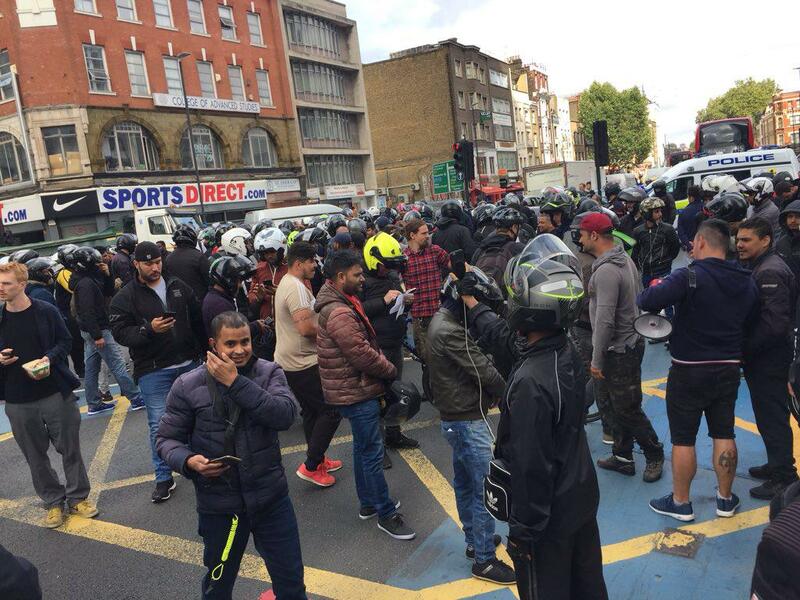 After an hour and a half of frustrated back and forth, the workers’ set off in a huge moped convoy for Aldgate Tower, home to Uber’s high level management offices. On arriving they blocked the major junction of Whitechapel High Street and Commercial street, just up from Altab Ali park. Another group of workers surged up to the front doors, and before long the whole tower was on lockdown. The police arrived and belatedly cleared the junction. At 3.20pm, they imposed conditions on the demonstration: the UberEats workers would have to move on by 4pm, or they would face arrest. In response to this threat, workers set off on another flying picket, this time down to Parliament square. Meanwhile, other workers were picketing restaurants in their local areas. Picket lines have been confirmed at multiple McDonalds across the capital. The strike is expected to continue into its third day, with a demonstration being called for the same time same place as yesterday - Aldgate, EC3A 7DT at 1pm. The larger context for this strike is the impending public offering of Uber shares in 2019. In the run up to this crucial moment, Uber CEO Dara Khosrowshahi has increased business focus on UberEats. The latest payment structure change seems to be an attempt to cut wages in order to increase profitability. The change comes at the same time as rumours emerge that Uber is in talks to buy Deliveroo’s European operation. Deliveroo, valued at over two billion dollars, is one of UberEats’ main UK competitors. A merger would constitute a huge consolidation of capital and a significant step towards monopolisation in food delivery platforms. This strike, following hot on the heels of strike action by couriers in Glasgow, shows that the trend towards militant action amongst food platform workers isn’t letting up. Over the past few years, strikes have spread across the UK - from London to Bristol, Leeds, Brighton, Cardiff, Glasgow, Plymouth, and Southampton. Workers in may more cities have taken small scale informal action and are in the process of getting organised. Few sectors have a comparable claim to such sustained working class self-organisation. The next substantial development would be for these city-wide fights to link up nationally, and take on UberEats together. Over the past few years, strikes have spread across the UK - from London to Bristol, Leeds, Brighton, Cardiff, Glasgow, Plymouth, and Southampton. Workers in may more cities have taken small scale informal action and are in the process of getting organised.